(Nanowerk Spotlight) Geneticists regularly use viruses as vectors to introduce genes into cells that they are studying. Viruses are also the most common carrier vehicles in gene therapy. Having been genetically altered to carry normal human DNA, they deliver the therapeutic genes to the patient's target cells. These viruses infect cells, deposit their DNA payloads, and take over the cells' machinery to produce the desirable proteins. Current trends in nanotechnology promise to take virus technology into an entirely new direction. From the viewpoint of a materials scientist, viruses can be regarded as organic nanoparticles. Their surface carries specific tools designed to cross the barriers of their host cells. The size and shape of viruses, and the number and nature of the functional groups on their surface, is precisely defined. As such, viruses are commonly used in materials science as scaffolds for covalently linked surface modifications. The powerful techniques developed by life sciences are becoming the basis of engineering approaches towards nanomaterials, opening a wide range of applications far beyond biology and medicine. The word virus comes from the Latin virus – "poison". A virus is a nanoscale particle (ranging in size from 20 - 300 nm) that can infect the cells of a biological organism. Viruses cannot reproduce on their own. They replicate themselves only by infecting a host cell. At the most basic level, viruses consist of genetic material contained within a protective protein coat. For scientists, a particular quality of viruses is that they can be tailored by directed evolution. The properties of the virus can be readily modified by changing the underlying construction plan – the nucleic acid sequence of the viral genome. It is also possible to produce viral chimeras that carry proteins of different viral origins. "Viruses can be multiplied in appropriate tissue and cell cultures but they do not have any metabolic activity of their own" Dr.Edwin Donath explains to Nanowerk. "This, in principle, allows the use of virions (nature viral particles) as durable building blocks for composite materials. In combination with powerful molecular-biology approaches, all these features provide novel and far-reaching possibilities for the production and engineering of hybrid composite materials from these nanoparticles." Donath, a professor at the Institute of Medical Physics and Biophysics at the University of Leipzig in Germany, together with first author Martin Fischlechner, published a review on the emerging uses of viruses as building blocks in nanotechnology ("Viruses as Building Blocks for Materials and Devices"). "Instead of chemically engineering functions into a composite material, it may be more convenient to take advantage of nanoparticles as carriers of the desired properties" says Fischlechner. "These nanoparticles can then be used as building blocks for the fabrication of a composite material with the required qualities. 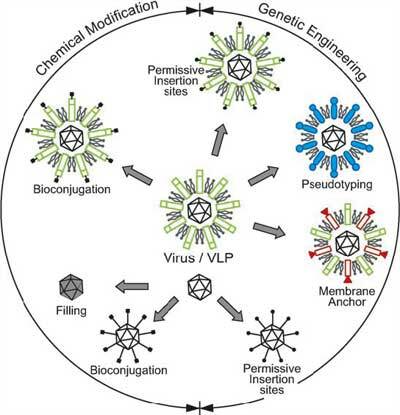 Engineered viruses may fulfill the role of the nanoparticles and once a convenient and general strategy to attach them to an interface is found, the setup can be standardized (the authors themselves, for instance, employ virus membrane fusion to attach biological functions to the surface of microparticles – "Virus-Engineered Colloidal Particles - A Surface Display System" ). The fabrication of a large variety of functionalized surfaces becomes possible by bringing together the potential of viruses for combinatorial surface display and a general strategy for surface attachment." Donath and Fischlechner describe two basic approaches to modifying viral nanoparticles to obtain desired functionality: chemical modification and genetic engineering. "By using the various techniques available for covalent coupling of molecules onto proteins, viruses can be used as a platform for spatially defined chemical surface modifications" says Fischlechner. "The advantage of using viruses instead of artificial nanoparticles is the defined number and orientation of the accessible functional groups on their surface. This provides the possibility to arrange different chemical functionalities with nanoscale precision." The concept of utilizing viruses as a synthesis platform can thus be seen as a nanoparticle-based 3D equivalent of nanotechnology methods used for arranging molecules in two dimensions. Viruses have already been employed as scaffolds for metallization or for the growth of minerals, resulting in metallized or mineralized building blocks. Viruses can also be used as nanocages for the entrapment of substances. "However, the true power of using viral systems originates from their unique quality as nanocomposites that carry all the necessary information for the production of their components within their host cell" says Donath. "This allows the display of specific polypeptides on the viral surface by engineering the viral nucleic acid sequence inside. The most straightforward engineering concept aimed at modification of the viral surface is thus to modify the genetic code of the viral genome itself. If successful, the product would be a genetically modified virus that is still able to replicate." The authors explain in detail how viruses represent composite nanoparticles that offer many degrees of freedom to design their surface properties. This can be achieved by either techniques based on chemical conjugation or by genetic-engineering methods. "Virus technologies based on genetic-code design are likely to see a steep development in the near future" says Donath. "Genetic engineering has a clear analogy to software production in that pieces of code can be multiplied at low cost, put together in an artificial genome, and processed afterwards in the cellular machinery. Repositories for standard (genetic) building blocks ready for customization for special needs are about to be established." He concludes that recent developments in microfluidics will certainly contribute to the parallel production of surface-engineered viruses at low cost and with a great diversity of functions. "Although this field is still in its infancy, automatic parallel production of viral building blocks seems possible when recent progress ranging from chip-based DNA manipulation to cell-culture techniques is considered" Donath concludes.